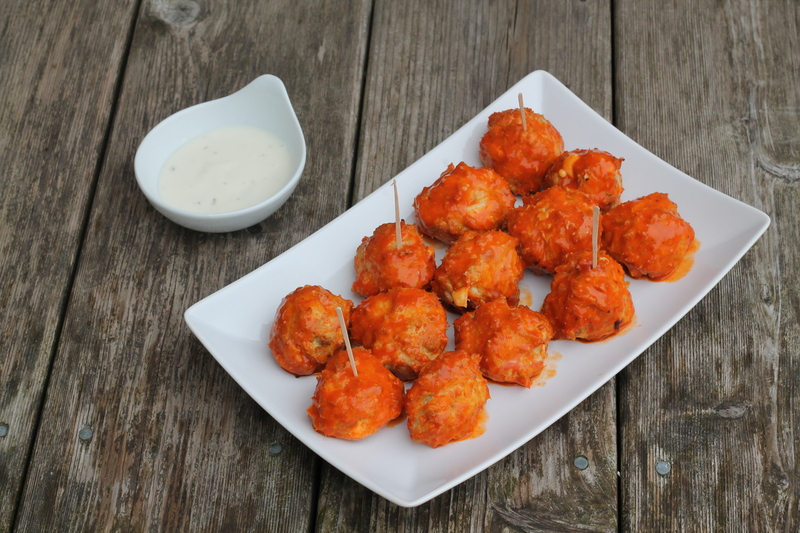 These are like buffalo chicken wings.. without the calories. Or at least that’s what I heard. They have GOT to be less than restaurant chicken wings, right??? So the buffalo chicken obsession is back in full swing. Or it never left/ended. 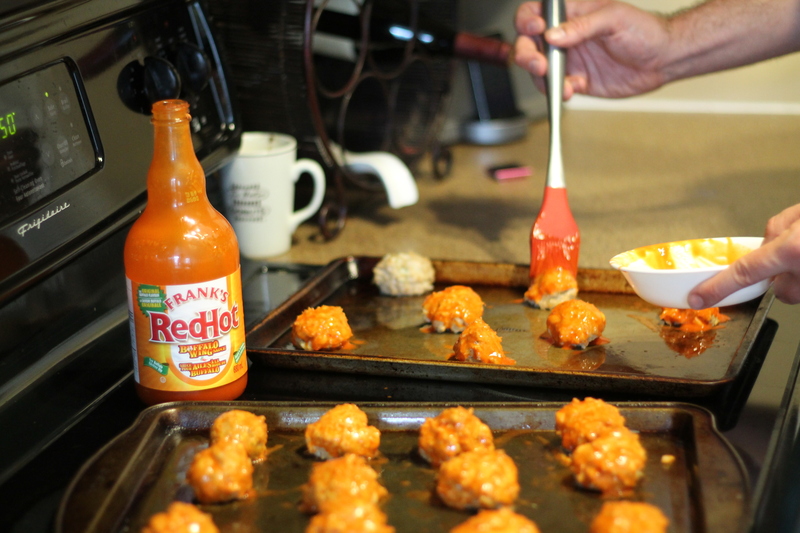 I still want to drink buffalo chicken sauce every bit as much as the day I discovered it. It’s OMG good. These totally should have been made during football season, but whatever. They were a yummy snack for a night when it was too damn hot to eat outside, actually. It gets that hot in Ottawa! It’s uncomfortable. Sometimes, at least. Anyway, these hit the spot. They’re perfect little turkey meatballs with crumbles of blue cheese inside (don’t worry, blue cheese haters! You can barely taste it!). And then basted repeatedly in buffalo sauce, obviously. Mix all ingredients except the buffalo sauce and dressing in a bowl. When completely and evenly combined, roll the meat in 2 tbsps portions into a ball and place on a greased baking sheet. Bake at 350 for 10 minutes. 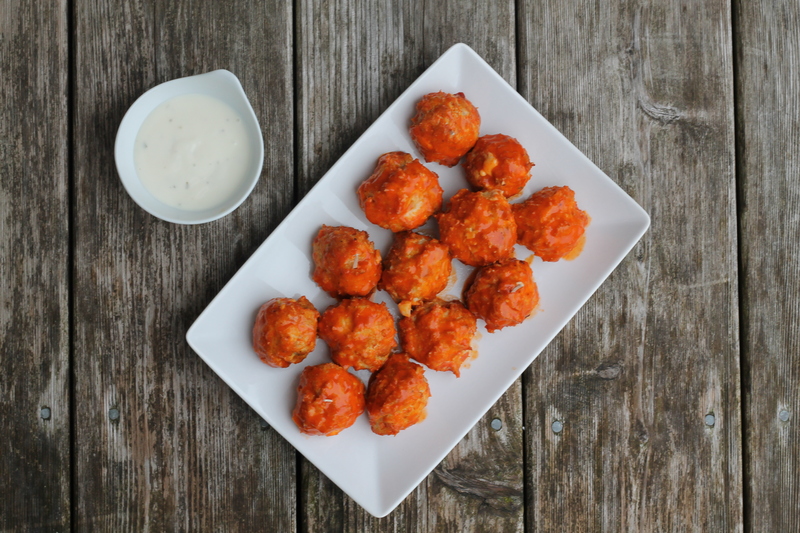 Baste all balls with buffalo sauce and bake for another 10 minutes. Rolls each ball in lots of sauce when done. Serve with ranch or blue cheese dressing for dipping.